The Orbital Sciences Corporation Antares rocket, with its Cygnus cargo spacecraft aboard, is seen on the Mid-Atlantic Regional Spaceport (MARS) Pad-0A at the NASA Wallops Flight Facility, Tuesday, Sept. 17, 2013 on Wallops Island, Virginia. WALLOPS ISLAND, Va. — A new commercial spaceship is poised to launch on a critical test flight to the International Space Station from Virginia's Eastern Shore today (Sept. 18), and you can watch it live online. The unmanned Cygnus spacecraft is the first space cargo ship built by the company Orbital Sciences Corp. to haul food and other vital astronaut supplies to the space station for NASA. Liftoff from NASA's Wallops Flight Facility here is set for 10:50 a.m. EDT (1450 GMT). Orbital Sciences Corp.'s cargo resupply demonstration mission to the International Space Station is scheduled to launch at 10:50 a.m. EDT on Sept. 18 from NASA's Wallops Flight Facility in Virginia. The liftoff could be visible from wide swaths of the U.S. East Coast. NASA is expecting good weather today, with a 75 percent chance of clear skies at launch time. The mission was delayed one day due to a minor technical glitch on the Antares rocket that has since been resolved. For Orbital Sciences, there's a lot riding on this test flight, which marks the first U.S. launch to the space station from Virginia. The company has a $1.9 billion contract with NASA for eight more deliveries to the space station using its Cygnus vehicles and Antares rockets. Its first Antares rocket launched successfully in April. If all goes well, the robotic Cygnus spacecraft should arrive at the International Space Station early Sunday (Sept. 22), where astronauts on the orbiting lab will use a robotic arm to capture the cargo ship and attach it to a docking port. The first Cygnus is carrying about 1,300 pounds (700 kilograms) of food, clothing and spare parts to support the space station's Expedition 37 crew. That includes some "goodies" for the crew, but it is only a partial load for Cygnus, which is expected to haul more than three times that amount on full-up delivery flights, according to Orbital officials. 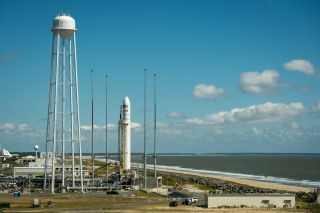 The Dulles, Va.-based Orbital Sciences has been developing the Cygnus spacecraft and its 13-story Antares rocket since 2008, when NASA tapped the company to receive $288 million in funding as part of the agency's Commercial Orbital Transportation Services program. Today's launch is Orbital Sciences' final milestone in that deal. "Antares is the largest and most complex rocket Orbital has ever produced," Orbital President and CEO David Thompson said. "After its flawless inaugural flight in April, we have been actively preparing for this next critical, much-anticipated milestone. Likewise, Cygnus is one of the most sophisticated spacecraft Orbital has developed and built." NASA ultimately picked Orbital as one of two private spaceflight companies to receive billion-dollar deals for robotic cargo delivery missions. The other company, California-based SpaceX founded by billionaire entrepreneur Elon Musk, has a $1.6 billion deal to provide 12 cargo missions for NASA using its Dragon space capsules and Falcon 9 rockets. SpaceX, which has already launched two of its 12 resupply flights, also received about $396 million to help develop its rocket and spacecraft. In addition to the first flight of the Cygnus, today's launch will mark the first space mission ever to launch toward the International Space Station from a U.S. spaceport that is not in Florida. The Antares rocket carrying Cygnus will lift off from Pad 0A operated by the Mid-Atlantic Regional Spaceport, a commercial Virginia spaceport located on the grounds of NASA's Wallops Flight Facility. It's the same pad used by the first Antares launch in April. Until today, U.S. launches to the space station have typically blasted off from NASA's Kennedy Space Center in Cape Canaveral, Fla. Russian spacecraft launch to the station from Kazakhstan, while Europe launches cargo ships from French Guiana and Japanese supply spacecraft lift off from Japan. NASA officials are expecting at least 1,000 people to watch the launch from the Wallops visitor center. Thousands more are expected to watch from nearby areas, and an unknown number of spectators may see the rocket's exhaust plume as it streaks toward space. Editor's Note: If you snap a photo of Orbital Sciences' Antares rocket streaking toward space, or any other amazing sky view that you'd like to share for a possible story or image gallery, send photos, comments and your name and location to managing editor Tariq Malik at spacephotos@space.com. SPACE.com's launch webcast of the Cygnus spacecraft will begin at 10:15 a.m. EDT (1415 GMT). SPACE.com partner Spaceflight Now is also offering updates via its Cygnus Mission Status Center, which will also include a launch webcast.